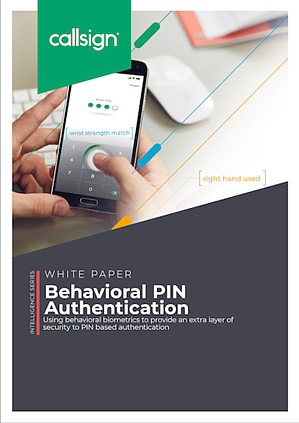 Download our latest whitepaper looking at using behavioral biometrics to provide an extra layer of security to PIN based authentication. There are countless statistics that highlight the fact that many individuals reuse the same PINs and passwords across their online accounts. All it takes is for a fraudster to get hold of a user’s details for one account and relay those across a multitude of other sites. As customers increasingly look to adopt mobile first journeys for banking, payments and online browsing, institutions need to ensure that the right layers of security are in place. With one-timepasswords/ PINs being one of the most common methods of two-factor authentication, it’s important that these methods are as secure as they can be. Building on the models of our unique swipe authentication, we have identified ways to combine behavioral biometrics with traditional PIN based authentication by analyzing multiple mobile based data points that are near impossible to replicate. This whitepaper outlines the architecture of the model, which makes use of AI and a range of sophisticated mobile behavioral data to verify the authenticity of a user when using PIN / knowledge-based authentication.